It all started out over 17 years ago back in San Diego, California when the Paladins were still in high school. They were already combining country, early rock & roll with blues and jazz, creating their own unique sound. Since then, the Paladins have released four full-length albums, a number of singles and consistently performed and toured worldwide upwards of 200 shows per year, many years driving up to 75,000 miles in their trusty old Dodge van (their current Dodge has over 360,000 miles on the clock!). The Paladins have traveled well over a million miles and now they have finally released the long-awaited live album, appropriately titled Million Mile Club (4AD). The Paladins-Dave Gonzalez on guitar & vocals, Thomas Yearsley on upright bass, and drummer Jeff Donavan (whose other numerous credits include Dwight Yoakam, John Fogerty, and Social Distortion) have developed a strong national and international following. They have performed and toured with the likes of Stevie Ray Vaughan, Los Lobos, X, The Blasters and The Fabulous Thunderbirds. In fact, it was Kim Wilson of the Fabulous Thunderbirds who took the Paladins into the studio in Austin, Texas and produced and recorded their critically acclaimed self-titled debut album in ’87. 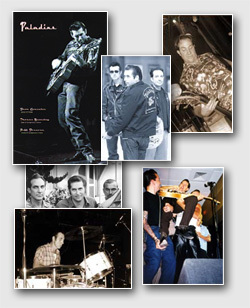 Live shows are what have kept the Paladins around for this long: ‘We thrive on the sweat and the energy that our crowds create’ says Gonzalez, ‘We’ve resisted gimmicks and pigeonholes since the beginning’ says Yearsley, ‘We just play music that we believe in.” The Paladins play their music to a continually growing legion of admirers who represent a wide cross-section of music fans, from retro-50’s fans to blues junkies to rock and rollers-basically anybody who is a fan of quality music that is played with passion. The Paladins have found passionate fans at their new label 4AD, whose diverse roster includes Lush, and Lisa Germano, among others. The Paladins have always kept three things in mind-quality, integrity and tradition-and Million Mile Club shows that The Paladins have remained loyal to those three objectives. And it’s clear that-because of having performed thousands of shows-The Paladins are a fully evolved band, competent and mature, tight but definitely not tired. And that’s not going to change.